To commemorate the 100th anniversary of the end of the First World War, here is the rarely told story of its final, pivotal year. When the Germans launched their offensive in March, 1918, World War One changed character radically—and nowhere more so than on the Western Front. This gripping and detailed account follows that final year, examining every battle from a new, refreshing perspective: it wasn’t just the British forces fighting, but also American troops and Canadian reinforcements, all masterminded by the tactical command of French General Ferdinand Foch. International in approach and filled with illustrations, it tells the story of those final violent pushes to the end of the war, and is a must-read for anyone interested in military history. Major General Julian Thompson served in the Royal Marines for 34 years and is now a visiting professor at the Department of War Studies at King’s College, London. He regularly appears on television as an authority on military history. 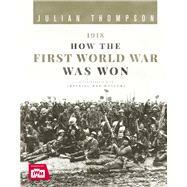 His other books include Imperial War Museum’s The Somme and Verdun: 1916 Remembered, The Second World War In 100 Objects and The Gallipoli Experience, all published by Carlton.